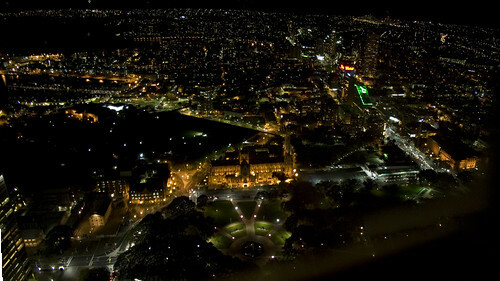 In May I was in Sydney, and had dinner at the revolving restaurant at the top of the Centrepoint tower. The food was not bad. The view was spectacular. I took a few photos, some of which were a bit blurry and most of which had some reflections from inside the restaurant, but with the help of Photoshop I managed to blend three roughish images together to get this. It’s reasonably high resolution, if you want to click it and see the other sizes on Flickr.